continues to redefine the idea of recycling. Gone are the days of sorting plastic bottles and yellowed newspapers; Now the only labels being read are on the designer clothing items for sale! “It’s the ultimate ‘green business,’ especially in such a tough economy,” Owner Michele Scott says of the two-time “Best of Delaware” and “Reader’s Choice” award-winning store. Scott uses her keen eye for fashion and strong appreciation of value to fill her customers’ budget-conscious closets with high-end apparel. But what’s the best part of this fashion-savvy spin on recycling? It benefits both customer and consigner. Scott says. “We all tend to hang on to pieces that we no longer wear, we allow them to collect dust and occupy our precious closet space only to eventually donate them to [places like] Goodwill when the cleaning out process finally occurs.” Many items for sale at Designer Consigner retail in new condition for hundreds and even thousands, but Scott manages to quench the thirst for designer brands at a mere fraction of their retail price. Today, women are looking for ways to make extra money while still maintaining their sense of fashion and style. In an otherwise bleak retail scene, consignment is thriving and is among the fastest growing segments of today’s retail market. Scott’s Designer Consigners are paid 40% of the selling price of their item. “I made over $700.00 in less than 3 weeks by taking my items in for consignment. It’s easy and fun!” consigner Barbara Thomas said. But as not to slight the more old-fashioned forms of recycling, the store forgoes paper print-outs by offering complete electronic access to each consigner’s account. Features include the ability to view consigned items online in real time as well as many other useful options such as email capability so that consigners can send direct messages to the store to, say, lower the price of an item (even further) or change their option of having their unsold items from being returned to donated. Designer Consigner proudly donates unsold and expired designer garments to various women’s charities, including Delaware Breat Cancer Coalition – because no woman should be Pra da-less. So as the seasons change, now is the time to make some room in your closet – why wait to re-organize, re-group, and re-sell? Why not go green and make some green at the same time? Stop in for a quick wardrobe pick-me-up or to make a consignment appointment. The store is open Tuesday – Saturday from 10 to 6, and on Wednesday’s (which are referred to as “wine down” Wednesdays) hours are 10 to 8, during which time you can enjoy complimentary wine and cheese while you shop! Sunday’s during winter season, (From Sept/May) the store is open from 12 to 4 — however closed on Sundays from June/Aug. Note: Designer Consigner is closed every Monday. 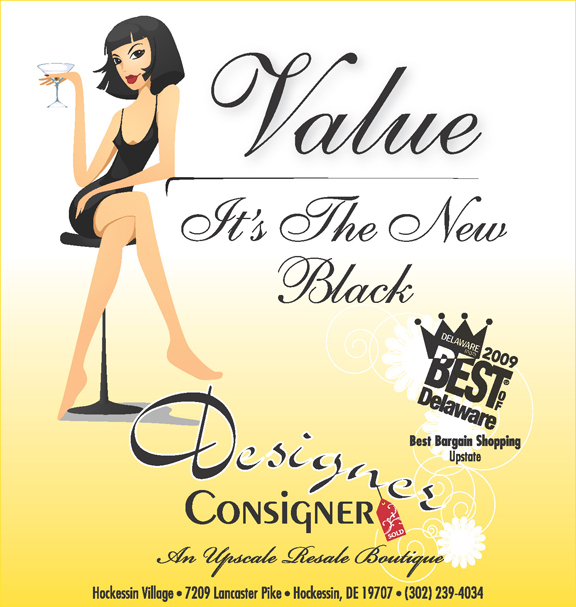 Visit us on-line at www.DesignerConsignerde.com for more info. and special events. ← Previous Story What Is Cosmetic Dentistry? Next Story → Employee Engagement And The Bottom Line!